Beautiful Equinox Flower is ready to be in full bloom at Jyourakuji temple! The main concept of thisHome Page is to provide you the best beautiful sceneries in Japan, especially near the Nikko areas. The reason why these famouse world heritage area are introduced , is simply because , I am living near the famous area. No other meaning. Near the Kanto districts, mainly, I was trying to gather the materials from Nikko area, and its vicinities, as the Tochigi prefecture is the location of the the FamousShrines in Nikko area. Many peoples want to know, want to see the beautiful scenes,thereto, off course. But actually, if you want to find out the spot, without any proper guidances, might be, I am sure, something very difficult, especially for the foreigners. If you look around these pages of my home pages , I'm sure you will be much pleased, appreciated with the beauty of the Japan's best spots, as these are introduced by this compiled pages. The various places , off course, may be instantly be found and introduced to you, at any time as you open the pages of my wonderful Home Pages! But I must apologize for the reason that theTranslation of all the pages into English are not available to you yet. But don't hesitate to look into my pages with the aide of the 'automatic translation' which I am going to introduce from now! And with it, I'm sure you will be delighted with the use of it, is very easy . OK, Now if you want to look my any pages except top page, all you have to do is copy the page URL and enter the URL to the boxes repaired by 'the automatic translation pages'. That all you have to do! No other efforts will be required! It's easy enough! The translation of this home pages are very easy! Other translation URL might be found in Iinternet web sites, but my selection is three url as above and itmight be enough, I presume. So please try to translate my page, by use of the above introduced processes. Then instantly, you will get toknow the meaning of my pages. It's very easy to communicate each other, if you want to know the Japan. As you know Nikko area is something very famous for the excursion area ,so that I proudly introduce these area with the best effort for you. Please, feel free to look around here and there in Japan as you like with the aid of the translation media. And surely you will find the best beautiful spot to be visited. And also am very grateful, if any peoples of the world will come to see this home page, and that will be the most important international transaction toward the world peace ! Get,reedy ? OK Ready Get set, Go!! so that translation machine mechanism will be exceeding the max point繝ｻ繝ｻ繝ｻ繝ｻ繝ｻbut other pages are surly translatable and works very well. Thank you for visiting us, our Japanese homepages, and please have a best feeling for you trips. By by!!! michikusa=normal dictionary say that the meaning is 'loiter about on the way ', but real meaning for me is to wonder around the way, while looking the beautiful places, and so on. Thank you for visiting my home pages. Be relax and feel free! And come again ! ・・ote・・/span>縲All the following picturers are linked to each pages you want to go! 縲So please click the picturer you want to go繝ｻ繝ｻ繝ｻ繝ｻ繝ｻ繝ｻPlease Enjoy Nikko! ・・ote・・/span>縲All the following picturers are linked to each pages you want to goto see! 縲So please click the picturer you want to go繝ｻ繝ｻ繝ｻ繝ｻ繝ｻ繝ｻPlease Enjoy Shiobara Spar! Peach Trees in Ena area------ This is the most beautiful Japn's peach trees. The colors are beautiful, off course,but the seasons are most ly loved by Japanese peoples. 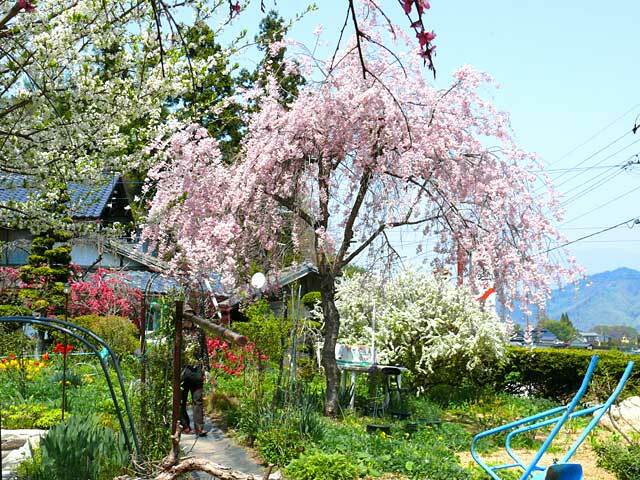 Because of the flower season may start form the mid of May, until that time, we can not be able to see the strong color flowers like peach trees, compared with those of cherry trees. ------The main vrsion of this Japanese Pages can be seen from here, Spring Peach Trees at Ena Area.-----As explaned before, you can easily translate this page by means of the process described beforhand. Please try this one , please. Peach Trees in Yamanashi Pref.------ These district is very much known by the Japnese, and peach production at autum sesons are so beautiful, and sweet! Many peoples from many country sides want to buy the sweet peaches of course, but they also very much appreciate its beautiful peach flower show in erly spring. This yamanashi Pref., You can see the Japans higher mountins very easy, and the peach flowers just before the thse mountins covered with the snow scene, can not be forget to be seen. 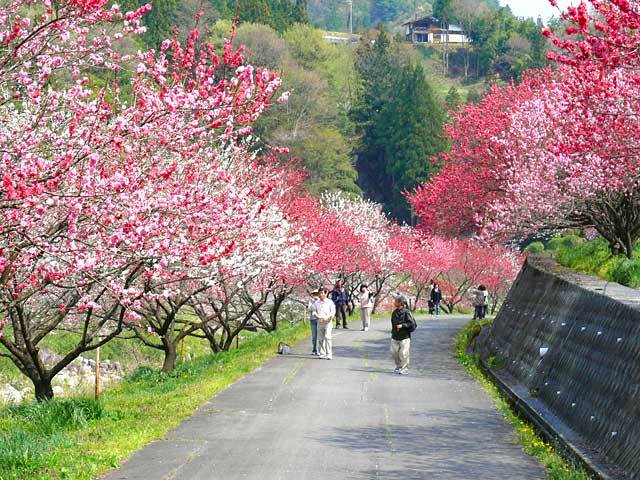 (Other likely pages been seen----Nirasaki area Peach Flower Trees. These are only the small examples of this homepage . I am sure, you will be found much more beauties in this homepages. Please, linger over your coffes, and do not forget to check my home pages at any time you like. Named under ' Tochigiken Michikusa Jyouhou' whichi means, travel around the beautiful Tochigi Pref., and stick around any places which you like as long as you like! And finally, I recommend the easy way to find out my best pages are: Site map, and Travel Index Pages. Please have a good time with these pages instructed, and have a wonderful Japan Trip! Toshougu and its vicinity walking may be found in these pages.----Let's walk around the toushougu area ! 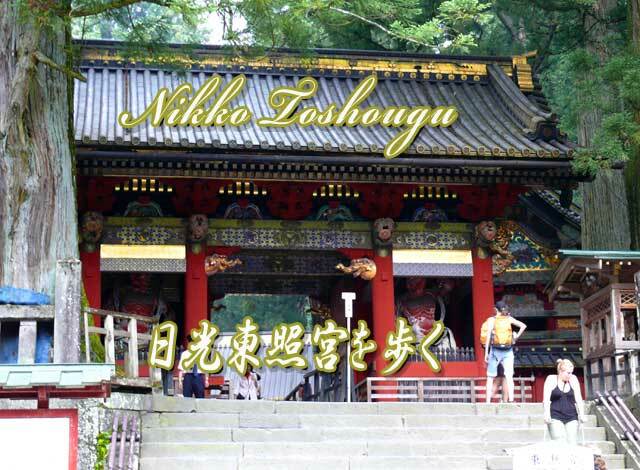 :Another pages recommended to you all is the [ Pages introduce you to the Nikko Main Town walk, where you can find the famous Shinkyou ( red colored bridge located near the Toshogu)]. Now, you may interested in the Nikko mountains. There you find ryuzunotaki-fall, whichi also you can see from [ Ryuzunotaki ]. And if you interested in the old budda , you can see them near the area, named 'Ganmanngafuchi' where you find more than 100 stone made budda which are very old, so many of them are mossed up by long year accumulation results. And other interesting facility is the Beautiful Botanical Gardens, Nikko located very near here. Copy Right Copyright(C) 2006-2007 hpmonda. All Rights Reserved.